The hour is also a big one for Aubrey, as it will kick off an important arc for him, as well. Check out some photos from “The Senator in the Street Sweeper,” including guest star Brenda Strong! 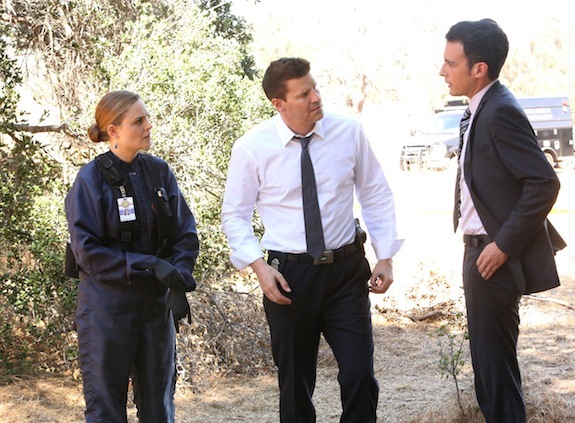 The ramifications of Booth and Brennan’s estrangement on BONES plays out for a bit, and in next week’s episode, “The Life in the Light,” the duo continues to figure out their new ground. 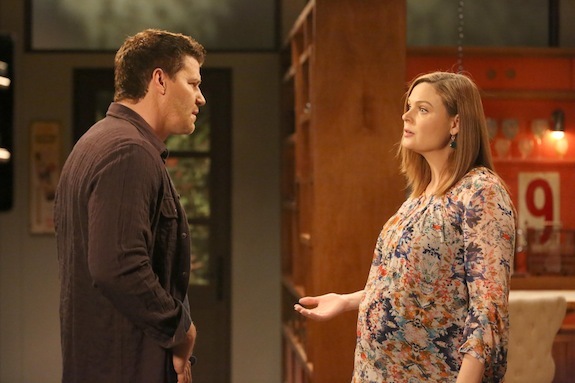 BONES is off this week, but the show returns next week with Booth and Brennan dealing with the ramifications of Booth’s relapse. 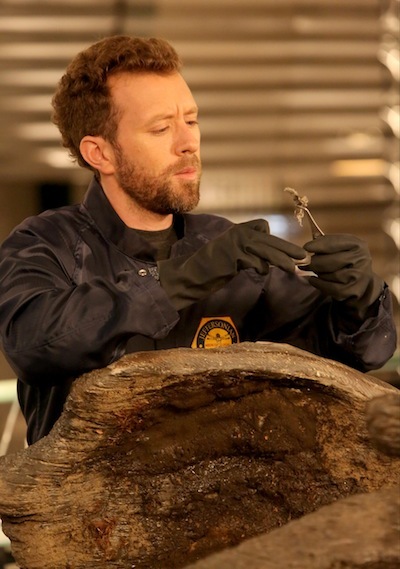 BONES is having a double-header on May 7th, as a high school student is killed (in the first hour) and then dip back into a previous case (in the second hour). 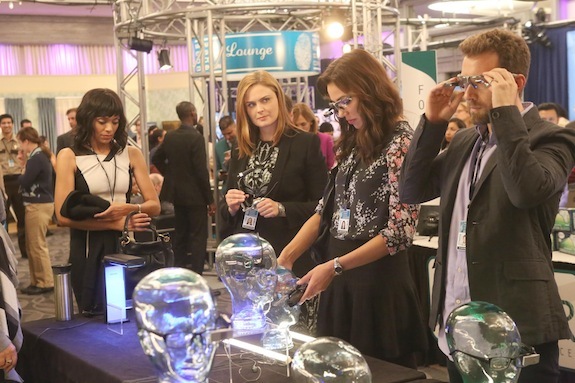 BONES will celebrate its 206th episode — AKA the number of bones in the human body — on April 30th, and though it won’t be as big a deal as the 200th episode was, there will be a little bit of fun in store. 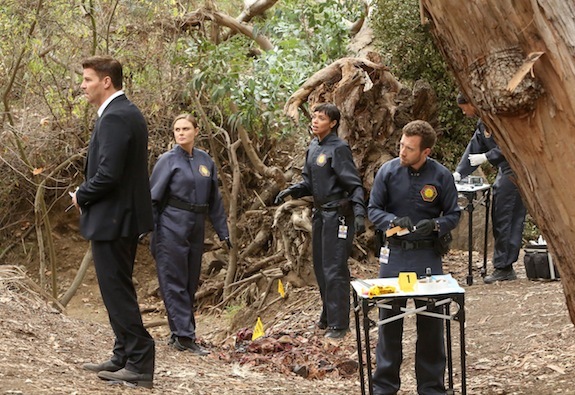 BONES is back on March 26th, and the team investigates the death of a psychic…whose remains were found in the trunk of a tree. 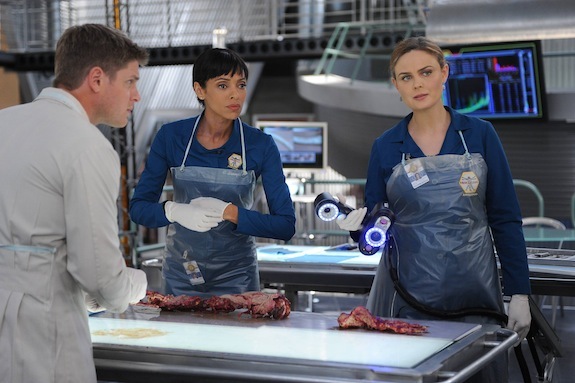 BONES returns Thursday, March 26th at 8 PM on Fox. 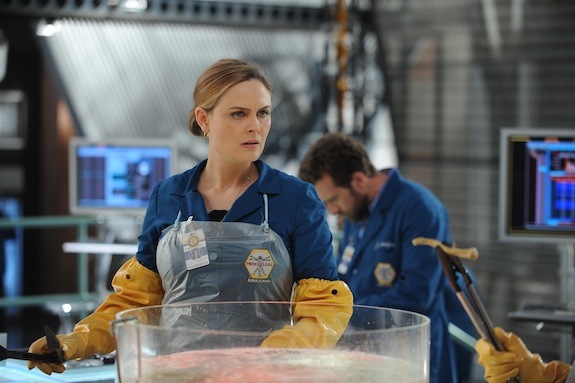 BONES’ 200th episode is reimagining the Jeffersonian and FBI teams in 1950s Hollywood, and the first photos from “The 200th in the 10th” are here! And, as you might expect, the costumes/hair/sets look gorgeous. Check out some photos from the 200th episode! 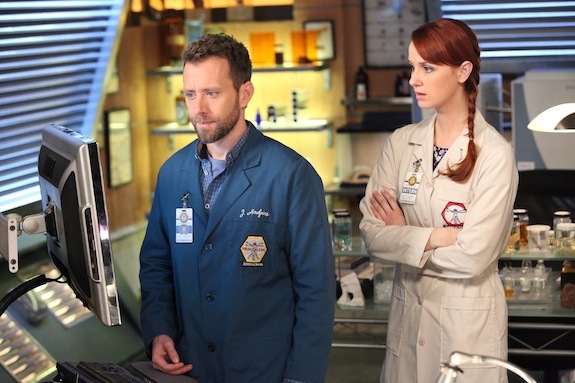 Comments Off on BONES 200th Episode Celebration: Check Out Photos! The cast and crew of BONES celebrated the filming of their 200th episode with an on-set celebration on Friday. There to pay tribute to the Fox drama’s run so far were the series stars, executive producers, a number of guest stars (including many of the squinterns, plus Cyndi Lauper and Ryan O’Neal), the writers, and a good portion of the crew. 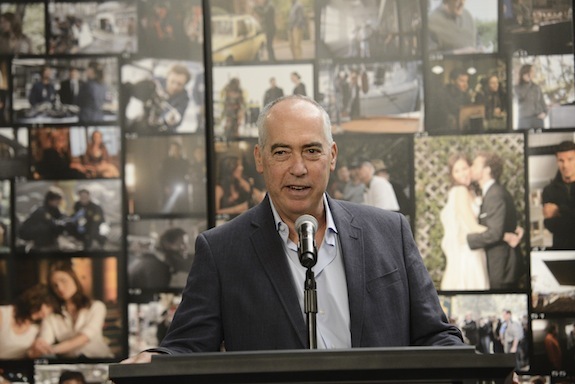 BONES 200TH EPISODE CAKE CUTTING EVENT: Gary Newman (Chairman and CEO, Fox Television Group) addresses cast, crew and FOX Executives during the BONES 200TH EPISODE CAKE CUTTING EVENT on set in Los Angeles, Friday, Nov. 14th. Cr: Dan Steinberg/PictureGroup for FOX. 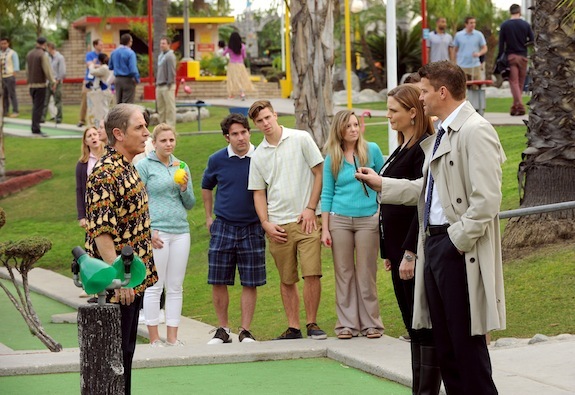 BONES is doing a little nod to WOLF OF WALL STREET in the upcoming episode “The Money Maker on the Merry-Go-Round” — which BONES executive producer Stephen Nathan noted could be the first time no one wants the team to solve a murder — and former ALLY MCBEAL star Gil Bellows will be guest starring in the hour. 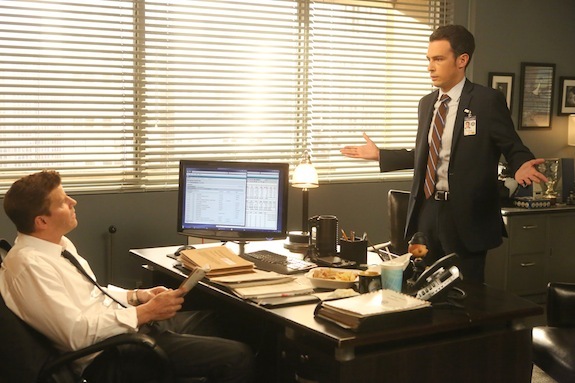 BONES is tackling immigration in the upcoming episode, “The Lost Love in the Foreign Land,” and the first photos from the hour are here! 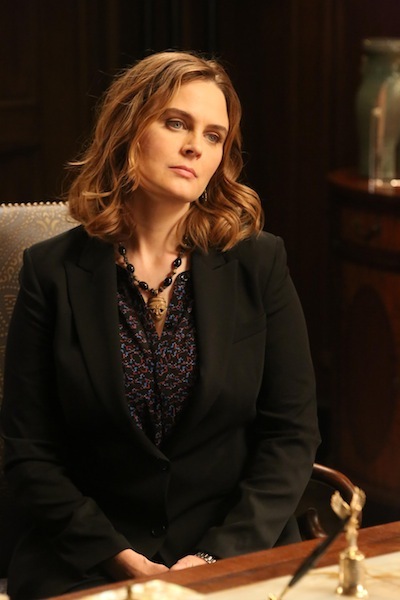 “The Corpse at the Convention” is bringing back a few familiar faces: Nora Dunn’s Tess (which BONES stars David Boreanaz and Emily Deschanel teased last month), as well as well as (sick) squintern Wendell.